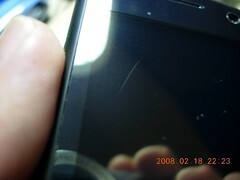 A little bit over a week since I switched to the HTC Touch Cruise, and I already have quite a few scratches on the screen. I'm pretty careful with the thing. I'd hate to see how it'd look if I wasn't. Now, in all fairness, the scratches don't impair anything. They're not even visible unless the screen is off and under a bright light. Nevertheless they do irritate the hell out of me, now that I know they're there. I have no one to blame but myself. HTC did include a screen protector; I should have slipped it on right away. I've never used a screen protector with any of my other HTCs before, so I figured I wouldn't need one for this one. Big mistake. Yikes... I'm gonna put the screen protector on mine asap. Did yours come with the case too? It came with a velour-type pouch. I don't own one but I believe it is more scratch prone since it doesn't have the raised bezel around the screen. Joe, did you actually try it? Can you still use the touchscreen with your fingers? This article was published on February 19, 2008 at 06:37:51 PST.